Private collection in London, UK. The reference that was used for this portrait was a low-res black and white photograph, not a great source for a painting but sometimes that’s all you have and when there’s a distance involved the opportunity to have the person pose for you is very limited, regardless of that I think it was a good outcome and the essence of the person was captured well. 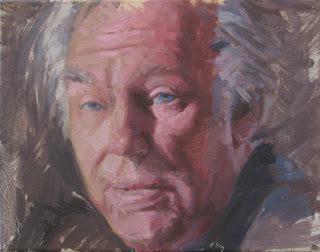 6 Responses to "Portrait commission, oil on canvas"
Great work. I also have a commission I’m working one with a low res photograph. How did you make sure that the skin tones were accurate, or did you just “invent” the color? Fantastic! I love your work. This has real character. Sarah, I just used a color mixture that I would normally use with a live model and I replaced the b&w values with color.